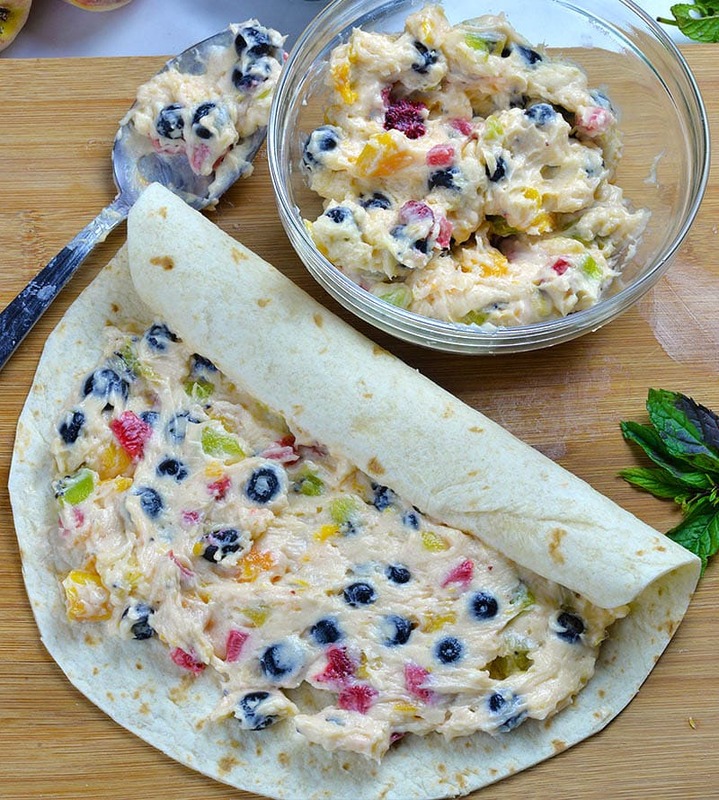 Cheesecake Fruit Salad Roll Ups are bite sized portion of classic summer treat. Fresh fruits and cheesecake filling rolled in tortillas and cinnamon-sugar are new and fun way to enjoy refreshing summer fruit salad. If you mix blueberries, strawberries and raspberries in cheesecake filling you’ll have festive red, white and blue dessert for 4th of July celebration. Cheesecake Fruit Salad are summertime classic. It’s so refreshing and very satisfying dessert or snack. Fruit Salad is also great way to trick your kids to eat fresh fruits. During hot summer days there are plenty of fresh fruits on the markets. You can use it in so many ways. But besides eating fresh fruits or making baked goods, easy no bake recipes are great way to use all that fresh fruits. Fruit salad are the best. However, cheesecake fruit salad is my favorite. If you like them as much as I do, then you should check my old recipes for Banana Split Dessert Salad and Tropical Cheesecake Salad or Lemon Poppy Seeds Fruit Salad. A bowl of delicious Cheesecake Fruit Salad sounds very refreshing and so delicious, but I thought I could make something new. That’s how I came up with this interesting twist on summertime classic. So far, I usually made savory salads rolled up in tortilla and cut in bite sized pieces. Maybe you remember my Chicken Avocado Salad Roll Ups, BBQ Chicken Roll Ups or Avocado Egg Salad Roll Ups. However, I thought, why wouldn’t I try to do the same with dessert salad?! And it turned out so fun and delicious. 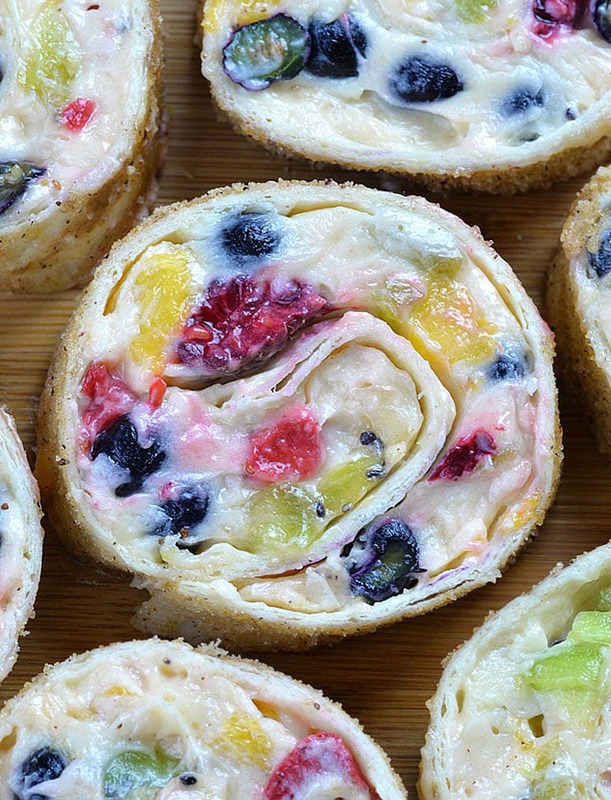 Small pinwheels of tortilla and cheesecake filling stuffed with lot of fresh fruits taste really amazing. 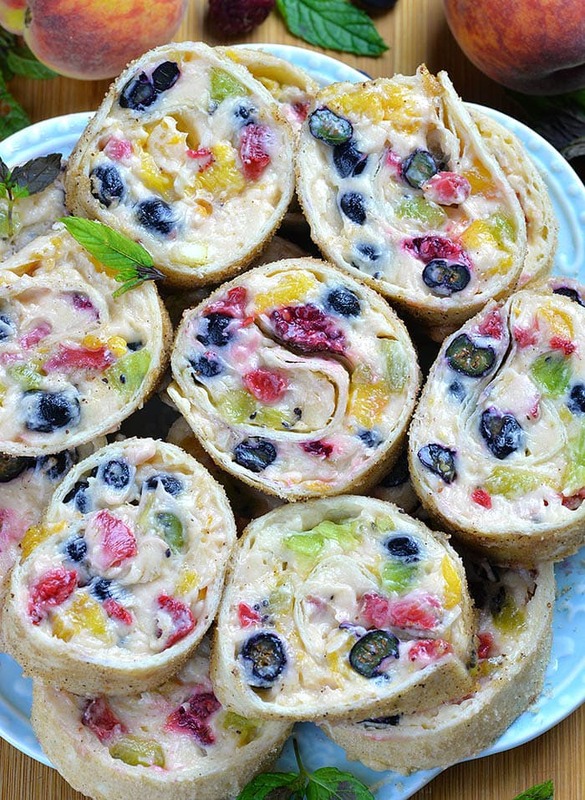 Cheesecake Fruit Salad Roll Ups are bite sized portion of classic summer treat. Fresh fruits and cheesecake filling rolled in tortillas and cinnamon-sugar are new and fun way to enjoy refreshing summer fruit salad. To make the whipped cream beat chilled heavy cream until soft peaks form, then add 2.5 Tbsp. powdered sugar and beat until stiff peaks form, set aside. In a large bowl cream together softened butter, cream cheese, vanilla and powdered sugar. Add whipped cream and mix to combine. Gently fold in fruits. If the raspberries are too soft I suggest you set them aside and simply scatter them later when spread the filling over tortillas (or they will tint the salad). Add vanilla instant pudding powder and stir in with a rubber spatula. Spread the mixture over tortillas and scattered raspberries on top. Roll filled tortillas tightly. Brush each tortilla with melted butter and roll in cinnamon sugar mixture. Cut in 2/3- ¾ inch thick slices and serve immediately. This sounds so tasty but is there a sugar free version of it for diabetics? ?